Probett spray is a cleaning product for dentures, mouth guards and removable braces. 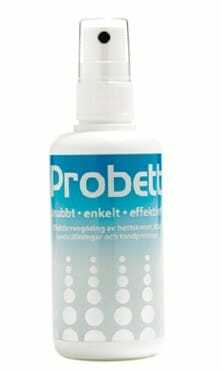 Probett effectively removes coatings (plaque) and leaves a fresh taste of peppermint. Probett can be used for daily cleaning and is available at selected dentists and dental clinics. Probett can also be ordered online at www.apotea.se. Remove the denture/mouth guard/removable braces before cleaning. Spray with Probett and leave for 5-10 seconds. Brush your denture/mouth guard/removable braces with a soft toothbrush and rinse under running water. Remove the denture/mouth guard/removable braces before cleaning. Spray heavily alternatively soak in Probett and leave for 6-8 hours. Brush your denture/mouth guard/removable braces with a soft toothbrush and rinse under running water. Do not spray Probett into mouth. Avoid contact with eyes. If contact with eyes, rinse immediately with plenty of water. Probett is a chemical cleaning product. Always read user instructions carefully before use. Probett safety data sheet (säkerhetsdatablad, in swedish).